WASHINGTON (CNS) — Pope Francis has accepted the resignation of Bishop Sam G. Jacobs of Houma-Thibodaux, La., and appointed as his successor Auxiliary Bishop Shelton J. Fabre of New Orleans. Bishop Jacobs, who has headed the diocese since 2003, is 75, the age at which bishops are required by canon law to submit their resignations to the pope. Bishop Fabre, 49, has been a New Orleans auxiliary since 2006. The changes were announced Sept. 23 in Washington by Archbishop Carlo Maria Vigano, apostolic nuncio to the United States. The installation Mass for Bishop Fabre is scheduled for Oct. 30 at the Cathedral of St. Francis de Sales in Houma. “I believe that he is the right person at this time of the life of this great diocese,” Bishop Jacobs said at a news conference. “I pledge to serve the needs of the church here in the Diocese of Houma-Thibodaux to the very best of my ability. In all that we do, it is the Lord Jesus Christ whom we praise and serve, and I am confident that together we will grow in faith,” he continued. 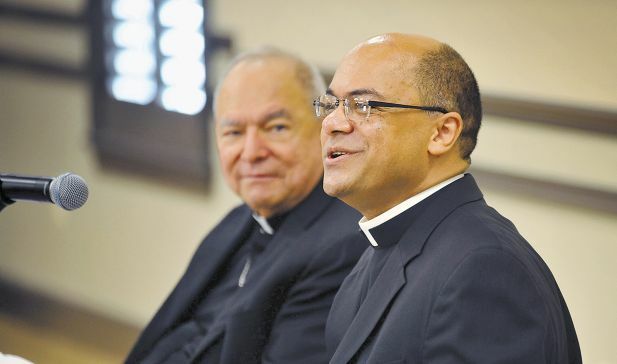 On the national level, Bishop Fabre is chairman of the U.S. bishops’ Subcommittee on African-American Affairs. He is one of about a dozen active black Catholic bishops in the U.S.
Shelton Fabre was born Oct. 25, 1963, in New Roads, La. He earned a bachelor of arts degree from St. Joseph Seminary College in St. Benedict, La., and a master of arts degree from the Catholic University of Leuven, Belgium. He was ordained a priest for the Diocese of Baton Rouge, La., in 1989, and auxiliary bishop of New Orleans in 2006. When he was appointed an auxiliary bishop, he was pastor of Sacred Heart of Jesus Church in Baton Rouge, La. From 1991 to 2004 he was director of the Baton Rouge diocesan Office of Black Catholics. Before his 10-year tenure as bishop of Houma-Thibodaux, Bishop Jacobs was head of the Diocese of Alexandria, La., from 1989 until 2003. A native of Greenwood, Miss., he was ordained for the Lafayette Diocese June 6, 1964. He earned bachelor’s and master’s degrees at The Catholic University of America in Washington. He has been chairman of the U.S. bishops’ ad hoc Committee on Catholic Charismatic Renewal and has been a regular speaker at charismatic renewal conferences worldwide. He also has been a member of the bishops’ Committee on Clergy, Consecrated Life and Vocations and a consultant to their Subcommittee on Catholic Home Missions. The Houma-Thibodaux Diocese covers 3,440 square miles in the state of Louisiana and has a total population of 202,000 people, with 96,719, or 48 percent of them, Catholic. Contributing to this story was Janet Marcel, a staff writer at the Bayou Catholic, the monthly publication of the Diocese of Houma-Thibodaux, La.